教学思路：English study is not only about words ,sentences and grammar , but about thinking in English , culture and customs. Through this school year , I will give a serial talk about these topics , today, I will firstly introduce something about the foreign culture and customs , that is to say, about the experience I had in America , this will give students direct vision into American life and customs ,especially more of their peers. I start the lecture with a song, which is from TV play serials called A Native of Beijing in New York, which tells about the experience a native of Beijing had in New York , I also had some experience in America, basing on the similarities, I lead in today’s topic: the America in my eye. 2. I introduce the related background , including the reason why I was sent to America ,the location of Toledo, Ohio and so on. 3. I show the pictures of the neighborhood houses decorated with lightings during the Christmas, introducing the way the locals celebrates Christmas. 4. I talk about and show the pictures of the house I lived in and the neighborhood houses. and talk of some habits to keep the house clean , like mowing the garden lawn on time and dragging out a big rubbish can to the roadside every Saturday morning and take it inside that afternoon . if I didn’t mow the lawn or take the can inside on time, my neighbor would get annoyed with me. 5. I show the pictures of funny things, like a minuscule library standing by the roadside, a small box for dog droppings, a pair of unclaimed glasses tied to a tree , these details reflect an attitude of elegance, consideration and enthusiasm toward life . 6. I introduce the details about the school I worked like the number of the staff and students, schedule, after-school activities, courses learned by students who want to get high school diploma and get college prep diploma . 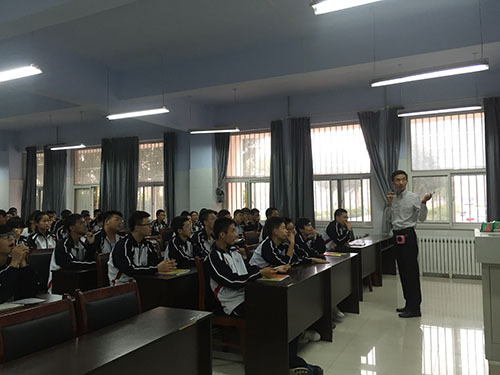 In China, it is said that American senior students have less pressure from higher education admission than we do, actually, it’s not completely right, they face the same challenge as our high school students do, wherever you are, you will be likely to choose a desirable college as long as you work hard enough. 7. 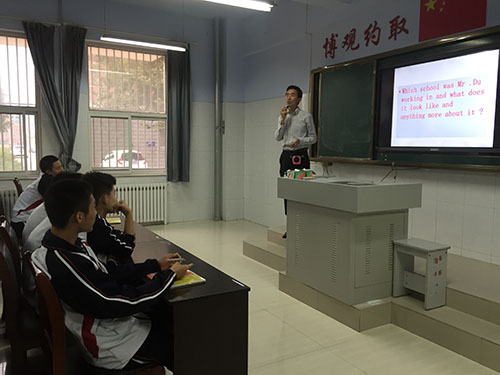 I show and introduce the pictures of the classroom of the Chinese language , the textbooks they use , the activities in class. Besides , every Friday, students would , on schedule, give a lecture about the Chinese culture, which we call presentation time. I used most of the classes to get them to practice speaking Chinese , the most difficult part for them is to write Chinese characters. 8. Guess the meaning of road signs. I make it a good interaction for students to learn about the American road rules . 9. I played a video of the seniors attending the 2015 graduation farewell, called graduation matching, in which seniors walking downstairs and hugging their teachers, friends or acquaintance waiting there already, it was moving and exciting. maybe our students probably like it ,after all, they are peers, and they are in an age full of curiosity.